Foreground, from left: Vermont Agency of Education staff members Donna Russo-Savage, Brad James and Emily Simmons face the State Board of Education at a meeting in Bethel on Tuesday. After an all-day meeting Tuesday in Bethel, the State Board of Education has adopted a set of guidelines to help steer its decisions about which school districts will be forced to merge under Act 46. 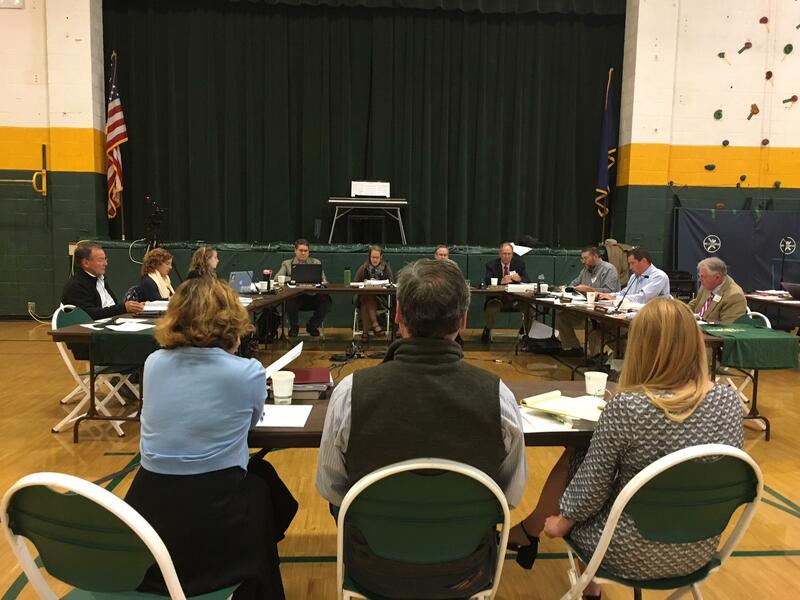 Earlier this year the Agency of Education put a draft plan together that made recommendations about all of the school districts in Vermont that weren’t able to put a voluntary merger plan together. But it’s up to the State Board of Education to make the final decisions. Board Chair Krista Huling said at the top of the meeting Tuesday that the school district consolidation law did not really establish how the State Board of Education should make its decisions. The board spent all Tuesday setting guidelines for how it will decide which districts will be forced to merge and which will be allowed to remain independent. The board says it will consider local town votes — however the board made it clear that just because a town voted down a merger doesn’t mean the State Board of Education will not force that district to join with its neighbors. But in including the town votes within its guidelines, the State Board acknowledged that the will of the voting public should be weighed when making decisions about forced mergers. The board will also look at geography and at how close potential merging partners are to the districts. And the State Board will also weigh how school spending and debt payments among the newly merged districts would affect budgets before forcing a merger. State Board of Education member Oliver Olsen said it was important for the board to finalize its guidelines Tuesday to make sure the school districts know how the school board will be making its decisions. “I think it’s really helpful for the process for people to understand the principles that we’re going to attempt to use to apply … some sort of a uniform standard for how we’re going to move forward,” said Olsen. The State Board of Education has 43 separate decisions to make, and they have to do all that before Nov. 30. State Board member Peter Peltz said with so many decisions and so many variations between the merger plans, there’s bound to be winners and losers. The State Board scheduled extra meetings to meet their Nov. 30 deadline, and they’ll begin making those tough decisions about forced mergers at their next meeting on Oct.17. Posted in Accountability, Advocacy, Arming Teachers, Charter School, Department of Education, Education Budget, Educators Protest, Every Student Succeeds Act, Failing Schools, Funding For Education, HBCU's, Higher Education, Mental Health, No Child Left Behind Act, School Closings, School Safety, Students and Parents Protest, Teacher Evaluation, Teacher Shortage, Technology in the Classroom and tagged "Standing Strong for Public Education", #iBelieve, Accountability, Accountability System, Advocacy, Department of Education, Diversity, Education, Education Funding, English Language Learners, Equity, Every Student Succeeds Act (ESSA), Failing, Failing Schools, Federal Education Policy, HBCU, High-Needs Students, NEAExecutiveCommittee, Pension, Pensions, Public Education, School Choice, School Safety, State Budget, Students, Tax, Testing and Accountability. Bookmark the permalink.